Private conservationists are managing over 26.5 million hectares of threatened forests worldwide in hopes of being paid to keep forest carbon emissions on lockdown. But these projects are in danger as insufficient demand for carbon offsets leaves them in financial limbo. One country – Indonesia – may have a solution, as the government contemplates voluntarily purchasing forestry offsets to catalyze domestic action. 26 February 2014 | JAKARTA | Southeast Asia has more than 27 million hectares of forested peatland, and peat releases devastating amounts of methane and carbon when drained or burned. 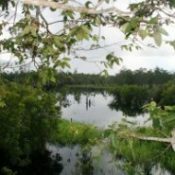 Approximately 80% of the world’s peatland is in Indonesia, and much of it is slated to be converted to palm oil plantations, thanks to land-use concessions granted well before the decidedly green President Susilo Bambang Yudhoyono took office a decade ago. At the same time, the Indonesian government is implementing a detailed strategy to harness finance from the carbon markets that will enable it to shift such concessions from forested areas to degraded lands. The country is also seeing a proliferation of smaller, private conservation efforts like the Rimba Raya “REDD” Project, which has rescued 47,000 hectares of forested peatland from imminent demise. Until now, public and private conservation efforts have been running on a parallel track – in Indonesia and around the world – as governments struggle to deal with the complexities of developing national strategies to avoid or reduce emissions from deforestation and forest degradation (aka REDD). Those national strategies won’t deliver verified carbon emissions reductions for years, while private efforts are already doing so. Yet these private efforts face an uncertain future, as the UN’s failure to secure binding international emissions reduction targets means a shortage of demand for offsets from endangered forest protection. It’s a quandary that governments have been reluctant to deal with, mostly because of the perceived complexity of uniting (and accounting for and financing) both public and private efforts under one roof. But Agus Sari, who is developing a REDD+ Funding Instrument for Indonesia’s REDD+ Agency, says it’s not as complicated as many believe. Last year he proposed the creation of an interim financing mechanism called Financing REDD+ in Indonesia (FREDDI) that would act as a “fund of funds” administered by under the REDD+ Agency to support forest conservation. In an interview with Ecosystem Marketplace he said those activities would include the purchase of REDD offsets voluntarily earned and certified to private carbon standards. As the first country to create a high-level REDD+ Agency, Indonesia is seen as model of sorts for other governments looking to implement similar strategies. For that reason, Sari’s proposal could have global ramifications. Headed by former Accenture executive Heru Prasetyo, Indonesia’s REDD+ Agency is charged with implementing the country’s National REDD+ Strategy, which is nothing less than a complete re-engineering of the country’s massive agricultural economy over the next five years. Some of the Agency’s programs aim to leverage country-to-country REDD finance facilitated under the United Nations Framework Convention on Climate Change (UNFCCC) to persuade palm oil companies with rights to forested land to instead shift their activities to degraded land. It’s a massive “land swap” that requires first sorting out hundreds of competing claims on various parcels of land, and then reorganizing Indonesia’s agricultural economy – from multinational agroforestry companies down to small-scale farmers – around more forest-friendly land-use plans. The strategy lays out a detailed sequence of activities to “ready” its economy for such a transition – beginning with institutional efforts including necessary changes to laws and statutes, and the “One Map” initiative that is slated to wrap up this year that consolidates scores of conflicting land-use and tenure maps from various agencies and districts in one consolidated, consistent database. The strategy is built on five “pillars” (see below). Sari says the private conservation financing initiative would fall under the third pillar – “strategic programs”. Sari says the REDD Agency can act as an intermediary between domestic and international carbon markets. “Here in Indonesia, we want to reduce our domestic emissions by 41% [below a business-as-usual scenario] by 2020, and in REDD terms that could mean about 1 billion tons of emission-reductions by 2020,” he says. The former head of Southeast Asia for EcoSecurities, Sari says the agency can also securitize domestic carbon offsets (or “carbon credits”) and package them for international sale. “We would not only buy and sell like traditional dealers, but we could package them so that we buy insecure credits and we sell secure credits, and that increases the value quite considerably,” he says. The government’s efforts would offer offset buyers a degree of certainty that they may not currently enjoy when purchasing offsets directly from private projects. Sari can’t say when that cycle will begin, but he says the feedback on his proposal has been promising. Key Companies Have Stepped Up on Climate Change. Will Governments Leave Them in The Lurch?